You may probably have an image of Japanese Travellers, 'Staying at hotel for a few days more than a few destination in a week'. Yes, you are right! But a new travelling style emerged Japanese market in the last 5 years and it is called 'Long Stay'.CQLA is a specialist and pioneer of this new 'Long Stay' market in the FNQ, Australia. The term 'Long Stay' is the term given to a stay at one location for a period of 7 days or more. This new type of tourist will experience not only at the major attractions of an area but explore more remote regions, interact with local people and mix with the community in general. This new style of travelling is suited to all generations however the majority of Japanese are in the age group 30-70 years old. This type of travel appears to be very popular with mature Japanese aged 50-60 years, financially secure who are able and confident to travel for an extended period. While the majority of people will stay for the 7 nights plus, many will stay for some months, and some find an area they particularly like and stay for some years. In Japan, 2007 is referred to as 'Baby Boomer's Year.' Many of these baby boomers would fit the Long Stay market so TV, Media, Magazine are targeting this group. This baby boomer market is estimated represent between 7 and 10 million people. Although this figure may only be a niche market in Japan with a population130 million, it is a huge market in terms of Australia. In fact Japans baby boomer population is over 50% of the total population of Australia i.e. 19 million. 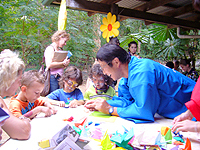 Australia has been the number one destination for Japanese for the past 5 years by the research of the Long Stay Foundation in Japan. We believe our research has indicated Australia the best country suited to the needs of the, 'Long Stay' market. Many of the new 'Long Stay' travellers will use this opportunity to evaluate if this type of travel is suitable	for their own lifestyle after retirement. We do not expect everyone retiring in 2007 to choose a 'Long Stay' experience but we are confident some will and many others will start planning for the future. We at CQLA are here to help you with the planning of you 'Long Stay' holiday. Mika Fujii, Managing Director of the company predicted the era of the Long Stay as a new style of Japanese travellers would come when she was still studying her MBA (Master of Business Administration) at the James Cook University in Cairns Campus as a mature student in 1998. Mika has done her intensive research about this market at her MBA and MBA with Honours Degree and concluded 'Cairns, Queensland and Australia' would be the best destination of Japanese Long Stayers. In 2001, CQLA, the company was established in Cairns (QLD), Australia to give extensive services to be required for the Japanese Long Stayers by Mika Fujii who was still at her MBA with Honours Degree. The company was soon appointed as an official representative of the Long Stay Foundation (of Ministry of Economy, Trade and Industry) in Japan. The Long Stay Foundation was established in 1992 and its purpose is to educate people/enterprises what is the Long Stay. Thousands of people whom are interested and desired to be Long Stayers already attended at Mika's seminars/lectures about 'Long Stay Life Experience', which were held in Japan over the past 5 years and Japanese Newspapers, Magazine and TV Program many times introduced CQLA. Mika Fujii and her CQLA now a day well known in Japan as the No1 specialist of the Long Stay Market in Australia. CQLA, as a pioneer of the Long Stay Specialist have been providing very extensive services to the Japanese Long Stayers to maximise their multi-cultural experiences in Australia. CQLA's consultation would concentrate maximising the benefit to our customers. By combining business and intellectual networks of Mika Fujii together with variety of the specialists in Australia, CQLA will provide any need of consultation like a business arrangement, visa requirement, asset and financial arrangements to our Japanese customers. 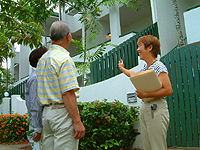 To find the suitable accommodation is one of the best interest of our Japanese customers. CQLA will provide variety of accommodation to satisfy each different individual requirement, as Long Stayers requires more demanding desires than short holiday travellers. From the self-contained apartment to a house to stay with Australian family or sharing with students for English education purpose, it is up to our customers' desire.. Some of Long Stayer want to stay for a few months or longer and so 'A rental property' is suitable from their financial reason. Or others want to have their second home in Australia, which allows them to re-visit and stay at their own home back in Australia. CQLA will also support all different individual desires from searching to contracting properties with after cares. What CQLA believes is the most important key for Long Stay is 'Communication with local people'. That is CQLA's mission and motto. Without cultural exchanges with local society and people, there is no meaning to stay overseas longer and live only with your own nationalities. The big challenge and the weakness to beat the cultural communication barriers to our Japanese Long Stayer is conversation skill. Most of them does not get used to speak (or hear) English at home and so feel very embarrassed to make mistakes by broken English. CQLA encourage Long Stayers to make lots of mistakes with English conversation, as Mika Fujii, Director of the company believes from her own experiences, it is the best to learn from making mistakes. It is against Japanese educational background and culture but CQLA always make our customers confident for expanding their new life experience in different cultural environment by breaking up something they have never done overseas before. We know from our experiences, the best way to make our customers experience the most enjoyable and unforgettable memories is 'To know and to do with the local people'. People are scared to challenge due to the miss-communication scariness in the beginning but will eventually do it with joy, as our customers knew CQLA is always there for them whenever they need us to support them. CQLA will provide variety of range's cultural programs, which make our Japanese Long Stayers to enjoy the cross-cultural communication with any level of English skills. 2) English Programs - Individual English Lessons, Special Senior Program at JCU, School Experience Program for mother and children etc. As same as short stay holiday tourists, our Long Stayers look after tour activities while their stay. CQLA assist our customers to find some experience program especially to link Australian culture and nature to learn. We also customise some short trip to different destination for a few days to expand their experiences as our majority of long stayers would stay in one city for a few weeks to a few months. Mika Fujii was originally born in Japan and has been living in Australia since 1994. Since her father's business was trading overseas, Mika grown up with a view of working to link the international market in her future. Her business background to link the international market started at the NYK Line (Nippon Yusen Kaisha) after her graduation from the Konan Women University at Kobe in Japan. After resigned the NYK and spending 1 year travelling Europe, Mika worked as the Sales & Marketing Manager for two different marketing & advertisement company where she was in charge of the Europe for the Benetton Formula One Racing Team in Italy and Asian market to the Sanyo Electric Trading Company between 1989 and 1994. Then Mika's interest to link the international market shifted into the international convention industry which she was always interested in. At the 10th International Conference on AIDS at Yokohama in August 1994, Mika was in charge of the National Convention Hall, a main hall (capacity of 10,000 people) as the Operation Director for a week. But in same year, Mika and her ex-husband were transfered to Cairns, Australia to look after a company but Mika still continue to have worked back as a director of conference for Congress Corporation, the Professional Congress Organization (i.e. PCO). After Mika worked at the Public Relation for the International Chamber of Commerce at the United Nations Relations Framework Convention on Climate Change Conference at Kyoto in December 1997 while she was still residing in Cairns, Australia, Mika decided to go back to study again and then enrolled her MBA (Master of Business Administration) at the James Cook University. While her years of study at MBA and MBA with honours, Mika became more interested in 'Natural Environment' 'World Peace' and 'Life Style' around her life and people in Australia than the high standard of materiaristic life style that was prestaged in Japan. All those background experiences in both countries made her predict what was coming next to the Japanese Market and what she can do for both countries as both societies are aging but the average life expectancy has been getting longer. That was the reason behind Mika initiated CQLA. CQLA was established by Mika Fujii who wishes to be a cross-cultural ambassador between Japan and Australia for a peaceful way of life. Mika's variety of educational and business seminars in Cairns on top of Long Stay Seminars and Lectures in Japan are all based in her passion and mission.